Isn’t that the most graphic metaphor you have ever read? I would say it has nothing to do with last night’s riots in Charlotte, but since I am quoting from a 2007 biography of Martin Luther King on his sentiments about urban areas and the suburbs, I am not sure that is true. What I do know is that the post title was already written up before last night’s events because I was struck by the anger in the statement. The sentiment there reveals a huge disconnect between what most Whites have been told about what King stood for and what Blacks and other minorities believe they are entitled to and have waited for too long. The book is From Civil Rights to Human Rights and it was cited in a footnote recently as I continue to piece together precisely what the synthesis is that public policy think tanks across the spectrum are coordinating around. If the synthesis is actually what King called a Third Way where governments at all levels “would sponsor poor people’s activism for social and economic rights guaranteed by government,” everything that is going on now begins to fall into its true role. Interesting isn’t it that it was MLK who wanted “metropolitan wide-planning in housing and economic development [that] would break down city-suburb divisions of power and privilege.” In other words what is going on now under the Obama Administration is less his overreach in many people’s minds than finally fulfilling “King’s decision to build a nationwide coalition capable of empowering all poor people and moving the nation toward democratic socialism” as the book’s author, history professor Thomas F. Jackson put it. Fascinating biography, but the point of this post is how much of a difference powerful images created by words can make in guiding perception about a person or an issue. That’s probably why that quote is not better known. It would have upset the narrative. Here’s another quote from someone at that Oxford Conference we covered in the last post, Eldar Shafir, writing to support a new book by Cass Sunstein called The Ethics of Influence: Government in the Age of Behavioral Science. I’ll bet it is, but like our lost invite to Oxford in May, how many of us know this book exists or that Ivy league professors are busy creating degree holders in public policy and other areas ready to impose these visions into what now constitutes education in the 21st century or the ‘rights’ written into laws and agency edicts? Beyond being a prof at Princeton and Harvard, Shafir has been tapped to serve as the first director of the Daniel Kahneman and Anne Treisman Center for Behavioral Science and Public Policy at Princeton. It was created with an anonymous $10 million gift in 2015 by someone who particularly admired Anne Treisman’s work in psychology. I found a bio on her at The History of Neuroscience site so let’s look at a shift she noted that is very important to governments wanting to control each student’s internalized capacities. “Ulric Neisser’s book Cognitive Psychology was about to be published in 1967, definitively marking the end of behaviorism and its taboo on concepts such as imagery, mental representations, and cognitive models. Contrary to the behaviorist idea that stimuli activate responses to produce behavior, the cognitive revolution saw stimuli as conveying information-reducing the uncertainty about possible states of the world by modifying mental representations–a major conceptual change. Attention [think of the ubiquity now of the word engagement] was central to cognitive psychology from the beginning, in part because it involved a purely mental event that changed what people perceived.” Daniel Kahneman is Ms Treisman’s husband and the winner of the 2002 Nobel Prize for Economics. http://www.gametheory.net/news/Items/088.html is a good link explaining why the Economics Committee decided psychology had become an important element of the discipline. Kahneman was and is a psychologist known for creating a means for calculating the way in which “irrational actions can be predicted and quantified.” Very useful, in other words, for governments wanting to control and predict just that. Predicting and quantifying that, it turns out, makes it important to know what Values people have and what Concepts and Principles frame their perception. If that sounds vaguely familiar now it’s probably because it is another way of restating what the new federal education legislation–the Every Student Succeeds Act–requires every school in every state to assess regularly using the euphemism Higher Order Thinking Skills and Understandings. That would also probably be why Getting Smart’s Tom VanderArk on May 27, 2015 reviewed Kahneman’s book Thinking Fast and Slow: How We Process and Respond to the World. When we find a report “Words that Change Minds” on what phrases, concepts, and framing should be used to push public policy issues http://www.frameworksinstitute.org/assets/files/PDF/chroniclephilanthropy_wordsthatchangeminds_2016.pdf that is using Kahneman’s insights. When the Common Core Social Studies C3 Framework wants students to practice with the provided ‘lenses’ in role playing classroom exercises, that’s again Kahneman’s work. When we are curious about precisely what lawyers are being trained to do in seminars that blend Law and Economics, it is important to know that the Nobel Committee thought it important to recognize psychology work that gives insights into decision-making in ambiguous situations where there is no single correct answer. Now, knowing what is really going on in K-12 education with personalized learning, virtual reality, HOTS mandates, social emotional learning standards, and authentic assessments embedded in real-world problems, let’s read about the behavioral “approach pioneered at Princeton, [where] policies are developed with a focus on what really drives people in decision making–the idiosyncratic and sometimes surprising ways in which they view their choices, perceive the social, economic and political world around them, and decide whether or not, and how, to act.” In other words, the behavioral approach the Center intends to build its public policy insights on and then recommend using the law as the means to force implementation in real world settings is precisely the same psychological arena, perception, that ESSA in the US and student-centered learning generally and globally has decided is the focus of 21st Century education. What are the odds? Notice just how much more clearly we could recognize the aims of Martin Luther King once biographers quit filtering his quotes to prevent us from recognizing precisely where he wanted to take the US to achieve his vision of economic justice. Time to truly appreciate the power of frames and conceptual lenses to guide future behavior and make it very predictable. Just like no one is inviting us to these conferences where these plans are hatched, no one is asking our input into the frames to be fostered in our children as internalized mental models and cultivated via emotions. I have seen many of the lists though and the real MLK and his vision of democratic socialism would approve. Did I mention that his biographer noted that the vision looked precisely like Marxist humanism? See that phrase is a real aspiration and not just some fetish I keep wanting to bring up. I see it because it fits even though now it has new names like Opportunity Society or Innovations in Poverty Alleviation. Those descriptions are just a few I pulled from the 2015 book of the Roadmap co-creator called Smart Citizens, Smarter State. Its view of the role of governments, at all levels, is that they are in charge of planning and managing social systems, like cities, people, and the economy. Citizens have a right to participate and be consulted, but as individuals they are bound nonetheless. Honestly, this vision made me wonder precisely what classes the author took at Harvard undergrad and then Yale Law, but somewhere she learned to have a very lofty view of institutions and their function for the 21st Century. (my bolding). I am a little old to have to be exclaiming “you’re not the boss of me” as if we are on a playground arguing over toys, but no, these stakes are so much higher as we saw in the Roadmap from the last post. Where does mind arson come in though? A couple of places actually. Noveck introduces us to a new word–epistocracy. That’s the idea that people who know more will be in charge. She points out that “If some have significantly better epistemic capabilities–relevant knowledge and skills–than others, this creates a tension with democratic equality.” They might also read that Roadmap, authored books, cited documents, and then piece together what is actually being contemplated in an unapproved way. That will not do in a vision where public policy wants to steer society and “Governments aspire to be the brain of their societies” as the report from an annual Oxford conference on policymaking sponsored by the same McKinsey Consulting that helped fund that Roadmap. Before we discuss that conference that should have a subtitle “there’s nothing governments cannot do once they marry public policy and the behavioral sciences,” I pulled a quote from George Orwell that one of my cybernetics books. It was used to explain that no governmental authority with aspirations of complete power over people and social systems can afford not to manipulate the news and permissible everyday knowledge. Here’s Orwell: “freedom of the intellect means the freedom to report what one has seen, heard, and felt and not be obliged to fabricate imaginary facts and feelings.” So what a wanna-be steering government in the 21st century needs is to control those perceived facts and feelings via the type of education available, without that actual intent being recognized. My analysis is that this is what School Choice does when its documentable history is followed through and its declared goals are actually tracked. My insistence that there is in fact a Left/Right Pincer action going on has been based on what is actually being said in articles and books too few read. We can thankfully get beyond that now as Ms Noveck tweeted on the blog tied to her book to a September 9 article called “A Revolutionary Toolbox” that a Costa Rican think tank had launched that thanked her for her help as well as a number of listed officials identified as being with the Atlas Network. If, like me, you search out those individual names you will find several are also tied to executive positions at the World Bank. Ding. Ding. Another cited influence is an MIT poli sci prof, Nazli Choucri, who is the Director of the Global System for Sustainable Development. If you have time, do look up GSSD as well as it provides yet more evidence that steering and Sustainable Development need Mind Arson. The site reads like a blueprint for the specified categories of knowledge that everyone must know and no more. Good way to keep anyone from grasping they are now being fed politically useful facts and guiding fictions with no means of knowing what is imaginary or not. So not only do “governments aspire to be the brains of their societies,” which gets so much easier if you circumscribe available information into a “knowledge system,” but another speaker at that conference, Eldar Shafir, a Princeton prof who also has ties to Harvard, seemed to have an aim that would go a long way toward creating any needed ‘imaginary feelings’ without that aim being accurately perceived. “Leaders in the 21st century need to understand human psychology rather than make false assumptions about it. [won’t state prescribed social emotional learning standards come in ever so handy then?] Humans are driven by a richer set of motivations than economists used to assume…Better data and analytics can combine with greater empathy and better psychology to shape more powerful and effective public policy.” A different conference attendee, Elizabeth Linos, gave even more incentive for governments at every level to actually want Mind Arson to fit with their expressed desire to plan, manage, and steer while calling such intentions–governing. “The past few years have seen an explosion of interest in behavioural science by policymakers at local, national and international levels. The first wave of interest asked: how can we use behavioural science to nudge our citizens to follow the rules?…The second wave considered the relationship between a people and their government.” All of these visions of public policy envision a regulation of the ‘market’ economy at all levels in the name of “many of the most central moral concerns we face as a society: concerns about distribution, welfare, opportunity, and the good life. It is therefore also a central concern for us as citizens in a democratic polity.” That was Noveck and we saw precisely the same concerns in those Habitat III documents and the conferences HUD has quietly hosted. In the comments to the previous post are links to what a Right to the City will factually mean. Honestly when I first created this blog’s metaphor of an invisible serfs collar, I only knew a part of the story. I am not sure I had ever even heard the term cybernetics before. Yikes! In order for all these plans for a fully inclusive, governments at all levels are in charge, steerable economy and society vision to work, governments have to control prevailing consciousness. To avoid opposition, that control cannot be widely perceived in time. Makes the timing of turning over the Internet to an international authority as of October 1 rather timely and propitious, doesn’t it? Unappreciated radically different conception of K-12 education and the loss of control over the Internet certainly seems like an excellent means to have “complete command over the interpretation of political concepts, which is necessary for complete steering of men from the outside” said the cyberneticians I found as I contemplated that Roadmap. That vision is what governments at all levels want and they blithely use the term public policy to obscure the manipulative intentions they talk about elsewhere at conferences we are not invited to and in books and reports we are not really supposed to read. That Roadmap for the Next Administration is not for us and it’s really not for a President Clinton or Trump either. It is for the people either would appoint to a federal agency or the judiciary and the professors of the elite universities that credential them. That sounds so much better that its essence of organizing what people in a society are to know, believe, perceive, and value so that they can be collectively steered. Sociological systems is just a fancy word for workplaces, schools, cities, economies, and all the other groups of humans who are to no longer be free to not submit to a “fully inclusive”, steered society. The original title ended with ‘of People and Places’ after I learned that the term ‘governance’ was actually a euphemism for ‘social control.’ That made for too long of a title though. The sudden and steady drumbeat in the last week proclaiming the need to “transform the relationship between State and Citizen,” whomever the next US President may be, quite frankly has scared me. Following up on those sudden articles unleashed a torrent of papers uploaded within the last year on ‘socio-cybernetic steering.’ Gulp. No time to get a book out to spread the alarm before the election and transition. Then yesterday my warnings from the last post about what the Rule of Law has come to quietly mean were reenforced in a very well-connected Regional Housing Forum in Atlanta. That program involved Affordable Housing, but the assumption was ‘public policy’ controls people and places and elected officials are the designated policymakers. All that is needed to get the “kind of City we wish to have” is an “end goal of legislation and public resources.” As an expert on what is really going on in the so-called silo of education and someone with a fair amount of economics training, these assumptions that prosperity can somehow be decreed and that legislative mandates will not have consequences are wrong. All these clear plans to redistribute the prosperity that more infrastructure will supposedly bring are both maddening and saddening, if the latter is even a word. I felt like Scrooge at a pep rally for people excited at the prospect that they will be able to fly and suspend gravity by legislative fiat. 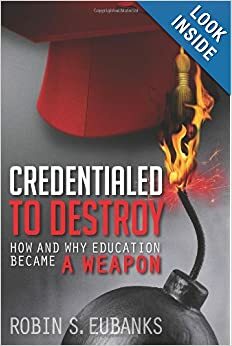 When I was organizing my notes recently as I prepare to write the sequel to Credentialed to Destroy, I kept having the recurrent thought that the phrases ‘evidence-based policymaking’ and ‘public policy’ had become the euphemisms for what used to be proclaimed a cybernetic steering of systems and institutions. It’s the same concept I have mentioned that the Soviets called Upravleniye— the scientific steering of society. It needs legislation to put it in place, specified goals to be met, and then data to show whether and to what extent those goals are being met. I heard the assumptions of Upravleniye yesterday even if none of the politicians, government officials, and presenters there have heard the term. Maybe I was particularly sensitive since in the last week I had seen Governing magazine do a September story called “25 Years Later, What Happened to “Reinventing Government’?” that I knew misrepresented the effect of that seminal book. Funny they should ask that now, especially as Michelle Jolin cited ESSA and the schools as the “underpinning of a commitment to creating a What Works Accelerator is already in place…The next administration will have an opportunity to channel this bipartisan energy into the launch of a new vehicle for results-based policy. A What Works Accelerator will not restore Americans’ confidence in government overnight, but by helping officials to address problems more effectively, it will move public sentiment in the right direction. It also will transform how policymakers at all levels envision their role in driving social change. ” Now I bolded that to make sure we all recognize that clearly, at all levels as the pet phrase keeps reciting, the purpose of governments is being radically and quietly changed from what we learned in civics class, in publications most of us will never read and a forums we are unlikely to attend. Hold on though please as this gets worse, much worse. Last Friday, GovLab released a paper called “Ready to Govern: Developing a Management Roadmap for the Next Administration” issued by the enormously well-connected (look up those partners) Partnership for Public Service and the IBM Center for the Business of Government. Now I covered IBM and its fondness for a “System of Systems” and seeing education globally as the means in my book, so you can bet I put this paper at the Top of My List of Things to Do. Even so, I was not really braced for what I found as the hurry to shift the US, whoever the next President may be, to a steered, People are systems and so are schools and cities, cybernetic, Upravleniye economy and society. It is everywhere, starting as soon as the election is over with the Transition Team of whoever wins. I asked myself would a President-elect Trump even have any idea of the true nature or even the existence of this laid-out agenda? Especially if his Transition Team is sprinkled with people with ties to the Atlas Network, since we already have documented the misleading narrative surrounding School Choice. He appears to use the term generically when he speaks, naturally unaware it has a provable, legal definition that ties it to the cybernetic systems vision of Bela Banathy (see tag) and several education profs at Indiana University. I know that, Atlas’ members and their fellows know that, but Mr Trump gives every indication of not knowing the ancestry of the phrase. It matters because as Ms Jolin noted education is front and center to the evidence-based policy making vision. It’s also how the desired Mindset gets invisibly put in place. As UNESCO’s Irina Bokova put it this week in the GEM 2016 report: “Now, more than ever, education has a responsibility to foster the right type of skills, attitudes and behavior that will lead to sustainable and inclusive growth.” Bela Banathy had precisely the same idea and created what he called a Guidance System to get there that School Choice, properly traced and understood, puts into place as a matter of law. It will be Banathy’s use of the term, and not Mr Trump’s or Ben Carson’s beliefs about what it means, that will take command as the next administration is pushed to embrace evidence-based policy making at all levels of government. It’s unlikely an accident either that one of the listed attendees at the January 2016 Roundtable that led to the Roadmap for the Next Administration is Jim Harper of the Atlas-affiliated Cato Institute. Another listed attendee is Steve Goldsmith, former Mayor of Indianapolis, a Romney/Bush 43 Domestic Advisor and author of numerous books. Now in a steering society, where everything that supposedly affects ‘individual well-being’ gets turned into a ‘public problem,’ this coordination would certainly explain what the various funders of all these think tanks, as well as the Chamber of Commerce, would adore about this model of steering society. Troublingly it also reminds me of what was laid out deceptively as Free Enterprise in the America Next report the Atlas members were pushing that I wrote about here. http://www.invisibleserfscollar.com/knowledge-to-avoid-becoming-roadkill-on-the-bipartisan-global-road-to-dignity-by-2030/ That would also explain why School Choice as pushed by Atlas members in earnest fits with UNESCO’s vision for creating the desired ‘right attitudes’. My experience yesterday at the Housing Forum can also be explained by what I consider to be the most duplicitous part of the Roadmap. It wants to create a “user-friendly neighborhood data infrastructure…to design better citizen services on a neighborhood-by-neighborhood basis.” Just imagine that dataset in the hands of federal agencies intent on ensuring Equity and Inclusion and legislatively enacting mandatory Inclusionary Zoning and Affirmatively Furthering Fair Housing or Health Equity. Data gets used to try to enact the UN’s SDGs or the Habitat III agenda at the state and local levels. Most people would be none the wiser as they, their children, and their communities get redesigned and socially engineered to fulfill a vision Uncle Karl theorized might be possible with the right kind of technology. That this is the true goal just jumps out of the bogus explanation for creating that neighborhood-by-neighborhood data base. That is a nonsensical statement. Entrepreneurs know that. It’s the governments, at all levels, who want that data so they can supposedly use the Rule of Law and public policy to change it via a so-called scientific management of society. Right for whom would be the timely question.